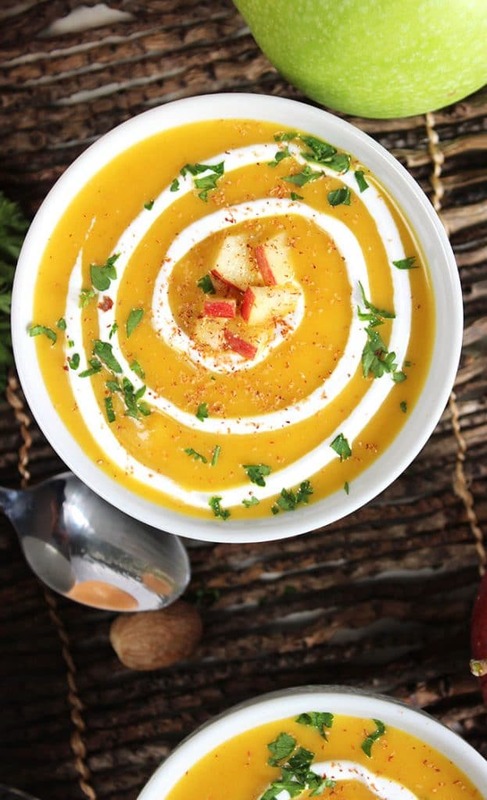 Fall in a bowl! 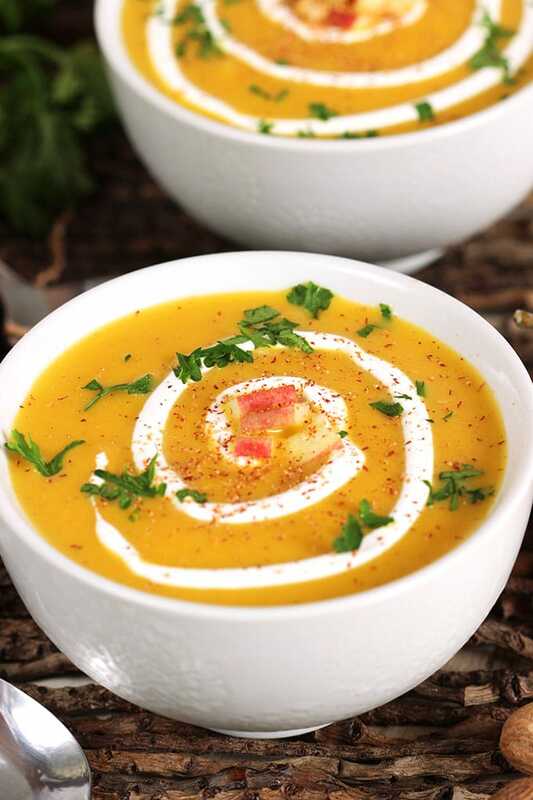 Creamy Apple Butternut Squash Soup is a light, creamy and rich bisque that’s lightly seasoned with the seasons warmest spices. 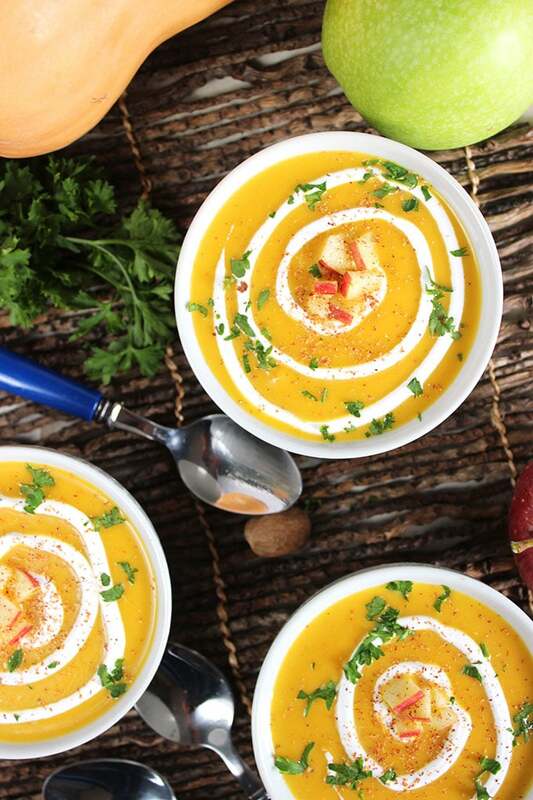 Apples and butternut squash are the perfect match in this simple to make soup recipe. You know those friends you have that you can go years without seeing or even speaking to…..not even a text….and when you do finally see them it’s like you just saw them yesterday? They’re the best kind of friends. I have a handful of them and one just stopped by for a leisurely lunch last week. It was so nice to finally see her in person and it started because we bumped into each other at the grocery store. Shocking, because I’m like almost NEVER there. (insert sarcastic grin here) But she and I have been friends for a really, REALLY long time and there were periods of time when we didn’t talk to each other for months (or maybe years) but every single time I see here….it’s familiar. And comforting and I feel like I’m 16 again, until I peek in the mirror but let’s just not go there today. We had a nice chat about things that are going on in our lives now, like kitchen renovations, hardwood floor installations, kids sports, runny noses, mid-life crisis’s (is that how you spell it??? ), you know all the things that come with adulting even though we still feel like we’re 25. We’re not. But it’s nice to know we’re not alone in feeling like we have more life responsibilities that we are mature enough to handle. And we talked about all of this over a light lunch of Creamy Apple Butternut Squash Soup and grilled cheese sandwiches. Because when you’re adulting and you want grilled cheese you should fancy it up with a light bisque-y soup recipe. She was my guinea pig for this recipe, too. Because when I invited her over I had planned to make this Chicken Waldorf salad but ran out of time and couldn’t get to the store. My family and I had just gone apple picking so we have like 20 pounds of apples that need to be used and since it’s fall, I always have a Butternut Squash lying around. 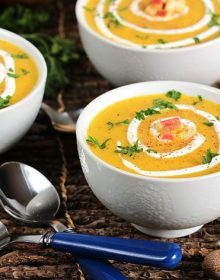 This Creamy Apple Butternut Squash Soup recipe takes no time to make and is lighter than most creamy soups. 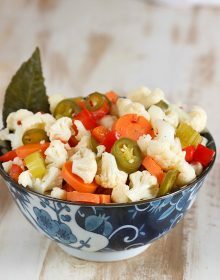 It’s the perfect addition to any holiday meal or just a fantastic light lunch with a grilled cheese sandwich. If you want to serve the Creamy Apple Butternut Squash Soup as a main course for dinner, serve it with a hearty fall inspired salad like this Bourbon Roasted Pear Salad (it’s completely bonkers, insanely delicious!). The soup would also be fantastic served in shot glasses for a fun appetizer on Thanksgiving day before you all gorge yourselves on turkey, mashed potatoes and stuffing. 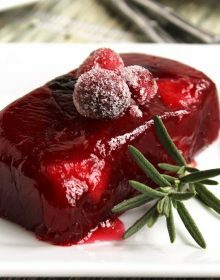 And if you’re looking for something a little sweeter you should definitely try this Chilled Cranberry Soup….it’s like a sweet treat before dinner! Heat the olive oil in a heavy bottom stock pot over medium heat. Add the onion to the pot and cook until softened. Stir in the garlic and cook for 1 minute. Add the squash and the apple to the pot. Cook for 4-5 minutes, stirring occasionally. Stir the stock into the squash mixture and bring to a boil. Turn the heat to low and simmer for 15-20 minutes or until the butternut squash is fork tender. Transfer the mixture to a blender and cover with a lid. (Hold the lid with a towel to prevent burns.) Puree the mixture until smooth. Pour the puree back into the pot and return to a simmer. Stir the cinnamon, nutmeg, ginger, salt and pepper into the puree. Simmer for an additional 5 minutes. Add the half and half to the soup. Stir to combine. Serve immediately with fresh grated nutmeg, diced apples and sour cream, if desired. Soup can be made up to 48 hours in advance and refrigerated in an airtight container. I love these kinds of soups! Perfect for fall! Thank you! They’re my favorite, too. The only thing that makes the cold weather bearable. 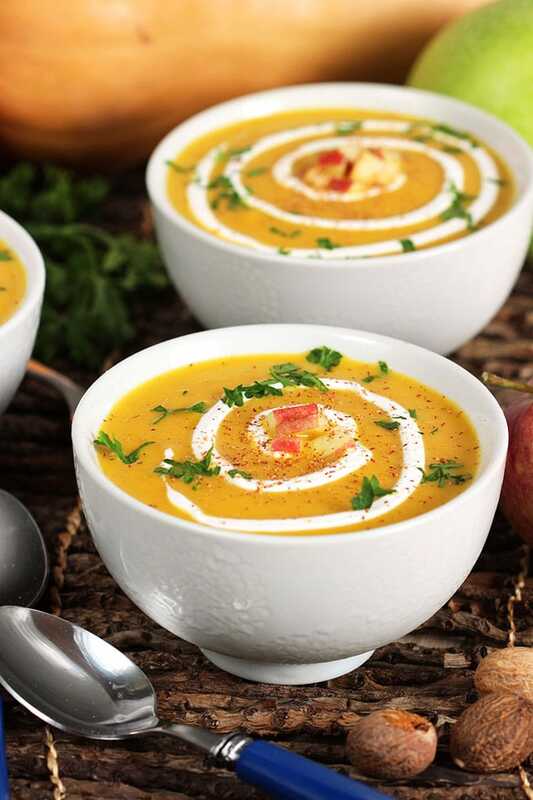 Butternut squash soup is one of my absolute favorite recipes of the fall, but the added apple in here just takes it to a whole new level. This sounds SO delicious! 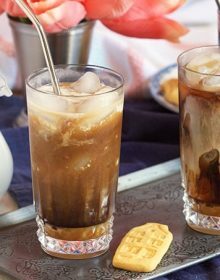 It just makes it a little sweeter….like a liquified pumpkin pie. Mmmmmm. 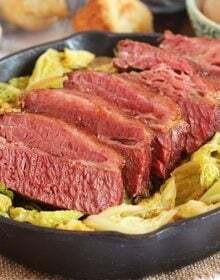 This recipe is simply wonderful, simple and is a delight, can do and super recommend, thanks for sharing.